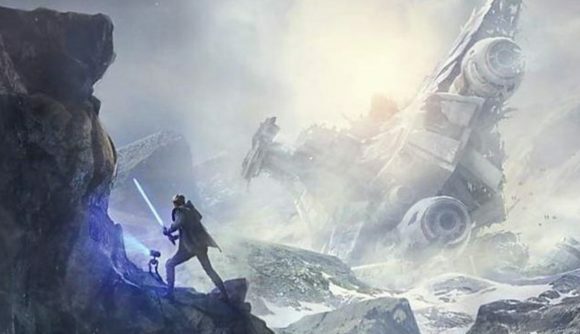 April 11, 2019 A fresh bit of art for Star Wars Jedi: Fallen Order has popped up. Star Wars Jedi: Fallen Order is going to be officially unveiled in less than 48 hours, but the internet has conspired to provide at least one more leak before it happens. A new t-shirt design featuring poster-style art for the game has gone live on Amazon ahead of the reveal panel, and while it doesn’t reveal much we didn’t already know, it does whet our Star Wars-loving appetites. The poster shows a rock and water-filled landscape, with lightsaber-wielding figure in the distance next to a small droid lighting the way with some kind of projection. There’s a crashed Star Destroyer in the background – one appropriate to the early post-Episode III era when the game takes place – and a fleet of TIE Fighters in the sky. If you want to buy the shirt, it’s still up on Amazon. EA has already given us an official teaser this week forJedi: Fallen Order, its highly anticipated, Jedi-focused action game. The publisher tweeted out an oblique teaser: a mysterious, vaguely lightsaber-shaped object, alongside the words “don’t stand out”. I say “vaguely lightsaber-shaped” because the object at the centre of the tease differs radically from more common lightsaber designs. Its hilt is more slender and less complicated than we’re used to seeing, and there’s a strange apparatus over what could be the emitter shroud. There’s also a lot of damage at the base of the hilt, as if it’s been cut in two. Perhaps this relates to the phrase “don’t stand out”. Maybe this is a lightsaber that’s been modified to make it less recognisable? That would make sense given what little we know of the game so far: the protagonist will be a Padawan, or student Jedi, who survives the Jedi purge at the end of Star Wars: Episode III. And here’s a full look at the poster. It’s likely that we’ll get to take the fight to the Empire later in the game, as we grow more powerful in the Force. I’m betting we’ll get to battle members of the Order of Inquisitors at some point in some exciting lightsaber duels, like the Reborn in the later Jedi Knight games. Personally, I am extremely stoked for this, mainly because I am naive enough to hope that Fallen Order will basically be Jedi Knight III (or IV, if you reckon that was Academy). The Star Wars Jedi: Fallen Order release date is confirmed for holiday 2019, but we don’t have anything more precise than that yet. All (or at least, more) will be revealed at Star Wars Celebration this weekend – tune in to the EA Star Wars Twitch channel at 13:30 Central time (11:30 Pacific, 18:30 GMT) on Saturday. Apparently there will be news about Episode IX at the same event, so keep an eye out for that if you’re looking forward to the movie.